Does Walking on the Stairmill Sideways Work Your Inner & Outer Thighs? There's a few muscle groups that can only be worked in a limited number of ways. Your inner and outer thighs are at the top of that list. You want to tone, tighten and sculpt your adductor and abductor muscles and are always looking for new and interesting ways to work them. Start looking past the weight room and into the cardio center for a leg workout that targets your inner and outer thighs. Walking on the stairmill facing forward is more of a challenge than you'd think because, unlike on a stair stepper, your feet actually leave the pedals and you have to lift and place them on the treads. It's much closer to a real-life stair climb. When you turn sideways and step on the treads by crossing one leg over the other, you increase the challenge and work your leg muscles from a different angle. That's when you engage your inner and outer thighs, and that's where you'll feel the burn when your leg muscles start to fatigue. In her 2009 book "The Ultimate Body Shaping Bible," Karon Karter recommends a workout she calls "multi-walking" for killing two birds with one stone. By walking forward, backward and sideways in intervals on the stairmill, you will burn calories and work your inner and outer thighs at the same time. One of Karter's multi-walking interval workouts starts you out by warming up for two minutes at a slow pace then stepping for five minutes at 3 to 4 mph. You then carefully turn around so you're stepping backward for one minute then turn to your right and side step for one minute before turning to side step on your other side for one more minute. Face forward again to repeat the interval four more times for an intense 50 minute cardio and upper leg workout. Changing up your stance while walking on the stairmill does more than work your inner and outer thighs. In 2009's "Winning by Losing: Drop the Weight, Change Your Life," Jillian Michaels advises readers to include side stepping on a stairmill as a way to not only work the thighs but to tone hamstrings, glutes and calves. And in 2011, Tony Ryan and Martica Heaner told readers of "Cross-Training for Dummies" that varying how you train, such as side-stepping on the cardio machines, is an effective way to improve your exercise results, keep your workouts interesting and reduce your chances of injury. 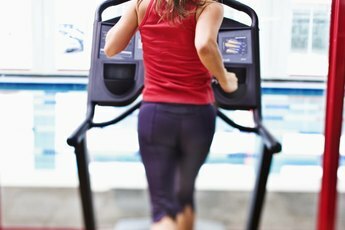 Walking sideways on the stairmill may be a way to target your inner and outer thighs, but turning mid-workout while the machine is running takes skill and caution. Slow the stairmill's speed down right before you change positions and grab the handrails to steady yourself, even if you don't use them during the rest of the workout. Place your feet on the outer sides of the treads to help keep yourself stable. When starting out, keep the program on manual for a week or two. Give yourself time to master sideways walking before you set the stairmill to a challenging program. What Is a Single Rep for Lunges?